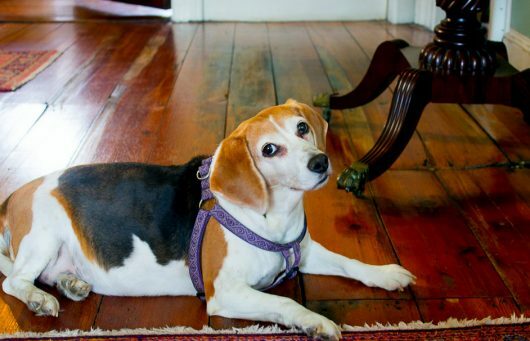 Lily the Beagle would like you to know there’s never a dull moment in this 191-year-old house. As I write this, the talented Michael Kerner is refinishing our entrance hall floor. Would you like to see some of the work in progress? 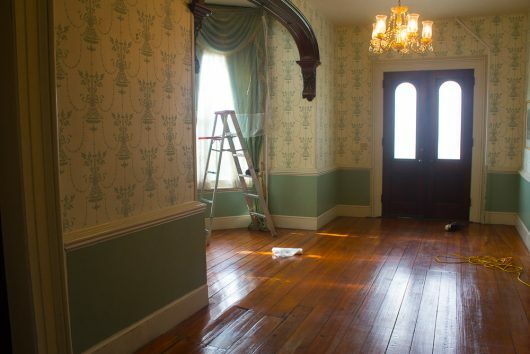 Before the first step — sanding — could commence, Michael and I removed tables, chairs, paintings, and a large antique carpet from the entrance hall. We stashed all these items in the parlor, located on the other side of the hall’s pocket doors. Michael climbed a step ladder in order to cover the green and gold window hangings with thick plastic. 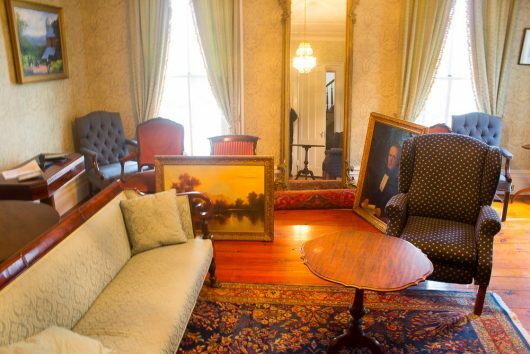 The parlor in question. Presently it looks like a cluttered antiques warehouse. Here’s the hall after the first sanding. I say “first,” because the floor has required many “going-overs” with different grades of sandpaper. And here is the same floor after every layer of polyurethane, stain, and dirt had been sanded and vacuumed away. You’re looking at 19th-century nakedness. Of course, the floor won’t remain undressed for long. Next week, stain and varnish will be applied. I’ll post the final results in “Part 2” of this post. Happily, Lily the Beagle has become great friends with Michael. She looks forward to his 9AM arrivals. Here’s the hall as seen from the kitchen door. The hall is “L” shaped, to accommodate the staircase. 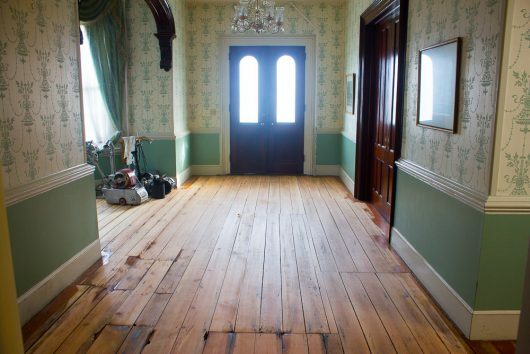 The different types of wood will not be noticeable once the floor is stained. Click here for proof. And here’s Michael’s equipment, stashed for the evening under the window bay. He’s a tidy contractor. I’ll admit that floor-sanding comes with lots of dust and noise. But the end product is worth these inconveniences. Personally, I like to see progress on this old, old house! 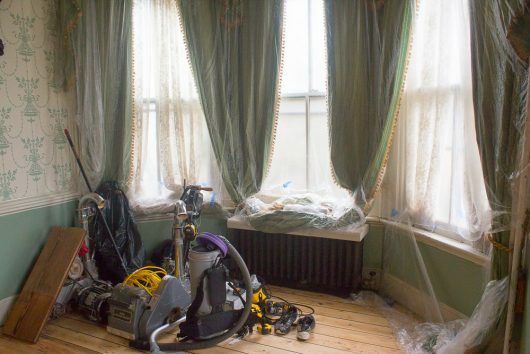 Any restoration or improvement projects happening in your own place? Talk about ’em in the comments field below! 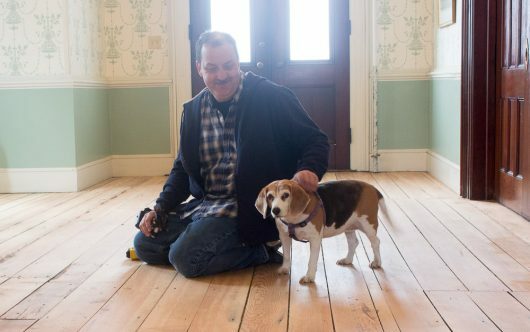 It’s going so beautiful- and elegant nothing like real wood floors – hey Has America favorite beagle put on some weight–?? Or has Lily been ill?? Can’t wait to see your newly re-finished floors. So far they look great! The “before” floor looks pretty good to me. So I am anxious to compare it with the “after”! I live in a single-wide mobile home, my adorable “tin can cottage”. It was built in 1978, so has tons of dark wood paneling everywhere, except the bedroom where the paneling is white. I saw online some pictures of gnarly trees painted on walls, with family photos hanging from the branches, and thought, “that’s within my skill set!” So I painted the long hallway a delicate apricot. Already it looks better, making the hall look wider and certainly brighter! Looking forward to the heat of summer when I’m stuck inside (AZ desert) to paint my own version of the tree. We retired last spring and sold our large home and purchased a 1965 stone cottage home. We are remodeling it ourselves and are on room 7. Unfortunately room 7 is a very large kitchen which now I wish we wouldn’t have saved for last as it is the biggest job and we are TIRED. But it is going to be fabulous and that thought keeps us going. I have 400 pieces of vintage pyrex which will be featured. Gorgeous home, lots of work but so worth it. I wonder what Lily thinks of it all?? Look forward to seeing more please!! Oh Kevin, we just finished a massive project using heart pine for big hall, dining room, kitchen and breakfast area. it’s gorgeous, with knots, and all the growing marks embedded. Comes from from long pines found in southern rivers with the “heart” extremely hard — . Sawdust, yes! New master bath, and replacing a few disgusting carpets. We’ve been wanting to redo the maple floors in our 1908 bungalow since moving in in 1993! Kitchen is getting a going over, first. LOVE LOVE LOVE your 191 year old house!! Re-doing the floors is awesome! We haven’t done anything like that … but of course we are in a 30 year old house!! We did however have water stains on our ceiling in spots and had someone come in and scrape them and did knock down ceilings! Looks like we have a new house! Some painting remains to be done and we will be finished! Ha – is one ever finished? Always projects to do! Just finished having four floors refinished in my 1947 Cape. Fabulous! Also love the paint that looks different in different light. I painted my outside shutters in Benjamin Moore ‘Wenge’. Looks like dark chocolate in the sunlight w a hint of purple on a cloudy day. Just perfect w ‘Bennington Gray’. Love your redecorating posts, Kevin! Boy Howdy, We sure do have a project in the works!! damages with us all huddling together in the bathroom. We walked out without with out any injuries but A Lot of work to do not only with our home but our entire property. Sadly, all of our 100 year old trees around our home were twisted out of the ground and lost. We feel very blessed and fortunate to be able to rebuild not only our home but our entire homestead. Truly, they just don’t make homes as durable as they did back in the old days. Kevin, I just love your home and enjoy your weekly posts. Hi Kevin, You three are brave! Years ago, before the invention of prefinished wood flooring I had wood floors installed in part of a house. The sawdust was everywhere afterwards. I could not believe how far it could travel. I vowed “never again”. This house has pine floors that have been seriously gouged by the dogs of previous owners and I would dearly love to be brave enough to have them done. I hope you will be able to encourage me and other cowards by an accurate description of the dust you have to deal with once the job is done. I am sure it will be beautiful and worth the effort, but oh, my goodness. them – keep us posted as to the finished product. Watching your floors makes me both want to get ours redone and thinking maybe not -I hate the noise and saw dust. Our project is the chimney that needs some new brick and tuck pointing. No fires until that work is done. Glad it is spring with summer on the way. 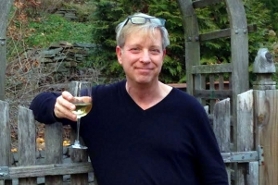 I am focused on the garden project – there are always things to do there. Good going, Kevin. Been through the renovation mill, good & bad. Husband and I moved a 2-story 1902 Victorian house 250 miles to 2/3rds acres inside the city of Austin in 2001. (Rich? No, we saved our money for about 5 years, then financed the move with a construction loan through a small local bank .) Everything house-wise had to be re-done (electrical, plumbing, roof, sheetrock), painting, A/C and heating), plus it rained in the house which meant the woodwork had to be redone. 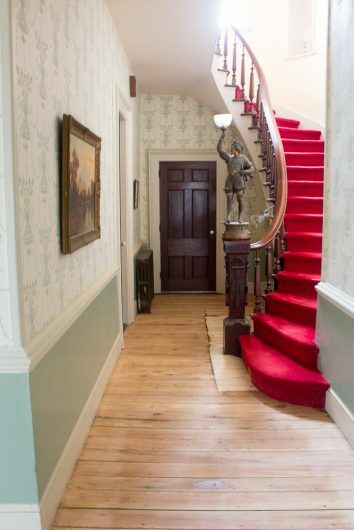 We had all of the long-leaf pine floors refinished as we could afford it.–That’s ten rooms. Without insulation, there was one month when the heating bill topped $500. Hubby passed away in 2006 leaving me to finish the renovation, and I eventually did. Start to finish, it took 15 years. I sold the house 2 years ago because it was too big for me alone, but it was my dream home. LOVE antique homes. Yours is a beauty. Golly Tamale, that floor is exquisite. How in the world did Michael keep it so pristine during the cleaning, sanding? My guess is he ‘tarped’ it between sessions. Again, beautiful treatment of very special flooring. My passion is my home and my guesthouse on the same property. In order to cover all teh costs for maintenance and upgrades I take in paying guests but it is worth it as they become new friends and fans of my home. Early this year I finished the solar install we started in late Fall. In May the rotomill and gravel driveways will be asphalt sealed. After all the damage the snow removal company did last Winter I had no choice but somethign I’ve wanted to do for years. A Master Bedroom and bath suite will be added upstairs where there are 3 small bedrooms and a large open great space. Wasted space in my opinion. We’ll end up with 2 small bedrooms and a large semi-private master suite with a sitting area, deck and private bathroom. 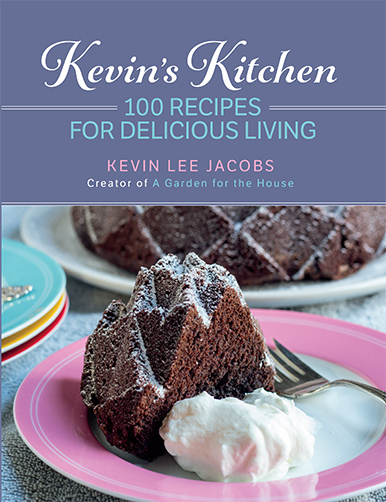 I love to see your projects Kevin and the pictures are inspiring. So are the recipes and garden advice. This summer we will finish painting our 200-some foot picket fence. Last summer we replaced the pickets but thankfully the posts were still good. And then I thought (silly me) that I would paint the whole fence by brush. I relented after the 168th picket and hours and hours of work, and allowed my husband to take over with a sprayer – for another four sections. Then his back problem got worse, so we wintered with bare wood on the remaining three-fifths of the fence. His back is almost better now; we’ll tackle the fence again in June – along with a thoroughly decrepit front porch that we hope to restore, not replace, on our 1848 home (tho the fence and porch came much later). the house and positively love them! 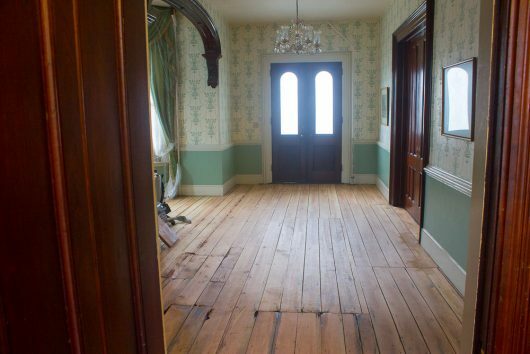 I am an old house freak and with that of course comes the LOVE of old floors. 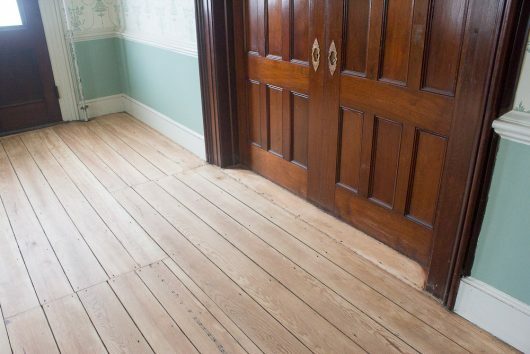 I think your old hall floors looked great so I am a bit nervous about you taking them down. Will they look as good? Scared to check out next week’s blog but I will. Crossing my fingers…..
We just got done finishing picture frame floors in the entire front half of our 1927 Arts & Craft-style 9-room house. It’s disruptive and required emptying a lot of rooms, but the end result is transforming! Worth the hassle completely! Love your floors, and what I see in your house. BTW, your braised short rib recipe wasa hit for New Years Eve! You have to go through the mess to come out on the other side! You’re getting there! I’m claiming (or re-claiming) our finished basement room as my Art room’ . it’s been left all alone since our sons moved out into the world. It was a boy scout meeting room a place to sit in front of the fire ,etc. It has a granite fireplace and one granite wall, a nice big window that i can arrange a table in front of to paint. . I’m not going to do much else …..a comfy chair to sit and contemplate, and lots of supplies. . . What I’d LOVE to do is move the laundry up stairs next to our MBR. That would be so handy. . maybe I will live “long enough ” to do it. LOL. . Sanding pine floors is an art because they are so soft. We had them in our NY house years ago too. Your contractor has done a good job! Do you use dried Tarragon for your chicken? I can only find the “Texas” version fresh here and its too strong for me .I like the French version. much better. I guess I should just ask the Persian restaurant where they get theirs. your floor looks beautiful! good old wood. Much floor sanding done in our old 1929 CAbin. Now about to freshen the entry here too. You Go Kevin! Tomorrow they start laying new flooring in our whole house. It finally rained a day ago and tonite the ceiling is leaking above where the new floor will be. It never ends. For every 2 steps, we lose one. But it will get done- after I call the roofer tomorrow! Everybody’s renovation projects sound so exciting! I will be raising my house 2 ft., reinsulating the floors, adding an extension so my well is in the house, and adding an Arctic entry. And a kitty door. Lots of $$, little excitement. We have a Gothic Victorian built in 1896. We are currently putting on an addition and I am having a hard time with the floor choices, there are so many that I am feeling overwhelmed. Rough pine plank is the direction that I am leaning. The rest of the house is pine flooring. I don’t want the room to be dark and my concern is that wood will not brighten it up. I am looking forward to seeing your floor reveal! Hi! I just wandered in and spent way too long browsing when I’m supposed to be working. Your house and garden are my dream come true. Can’t wait to get more tips. I would love to know more details about your entertaining. I’m sure it’s tough to take photos when you’re hosting but even details about your prep and menus would be wonderful. I am in the process of refurbishing my home…and just this weekend was looking at the floors. I’m pretty sick of living in a construction zone, but I know it will be worth it in the end…if an end is actually possible. Sure hope my (deceased) grandparents would agree. This is their old adobe home and nothing is square, but the good news is the exposed floors look to be keepers, after some much needed elbow grease. Wish me luck!! Congratulations on getting the restoration work done on the floors! the only restoration here is weekly mopping! I’m on the final leg of a renovation/restoration of a 1928 two family house that hadn’t been updated since the 1960s. Had the awful aluminum siding removed last fall and I am having the original wood siding and cedar shake painted this summer, as well as getting all new storm windows. Then all I have to do is restore 50 original wood windows, easy peasy. Haaaaaaa. We are working on fixing our upstairs walls, the old lathe and plaster. Our home was built in 1880. Its a messy job and definitely not a fun one, but has to be done.